The Paulick Report is pleased to offer a special print edition that will be available in South Florida at Wednesday's Fasig-Tipton Gulfstream Sale, and of course, it's also available here. 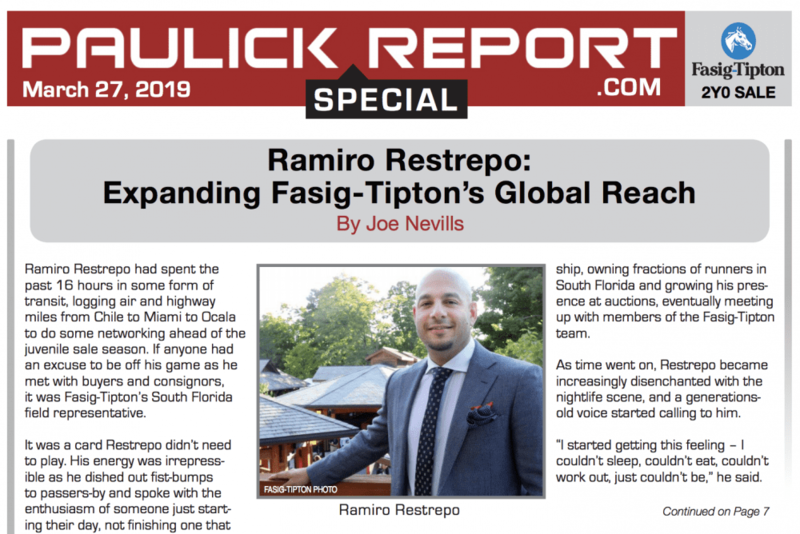 In this edition of the PR Special, Joe Nevills introduces readers to Ramiro Restrepo, whose family ties to the Thoroughbred industry stretch back five generations in Colombia and who is developing relationships for Fasig-Tipton in South America from his base in South Florida. In the Stallion Spotlight, Nevills takes a look at the first crop of juveniles from Constitution, a multiple Grade1 winner standing at WinStar Farm, and in the Honor Roll, learn more about Kentucky Derby contender Instagrand, a Gulfstream Sale graduate. Plus, a look at some hip numbers to pay close attention to at this 2-year-old sale in Ten to Watch. Ask Your Insurer tackles the subject of breeze show injuries and transportation while Ask Your Veterinarian takes a question about the effectiveness of vaccines. This entry was posted in PR Special, Ray's Paddock and tagged fasig-tipton, Fasig-Tipton Gulfstream Park Sale, instagrand, joe nevills, PR special, Ramiro Restrepo by Paulick Report Staff. Bookmark the permalink.